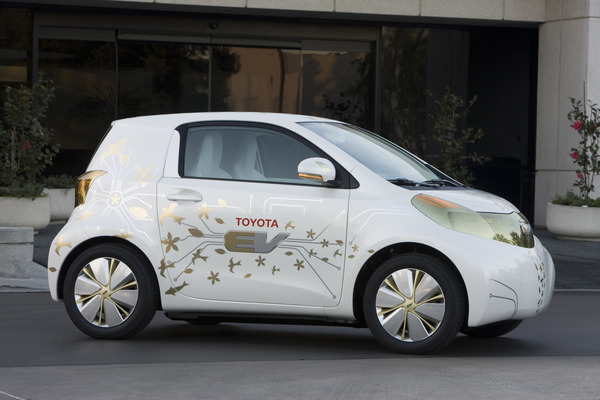 At the Detroit Auto Show in January 2009, Toyota revealed its electric iQ city car. At the time is was purely a concept and Toyota did not state its intentions to get into the pure electric car game. Indeed Toyota's longstanding reluctance to build pure electric cars is understandable as they might compete directly against their flagship green car Prius which took so long to make popular. With all they've invested in hybrid technology marketing a pure EV might in some ways be shooting themselves in the foot. Nonetheless it appears Toyota has succumbed to the global pressure and is now committed to building the car and launching it in 2010. According to the iQ's chief engineer Hiroki Nakajima, the electric version of the iQ, internally known as the BEV will not compete directly against the gas iQ. The tiny car will actually utilize in-wheel electric motors and have a 93 mile all electric range and take 7 hours to charge. Interior materials will be upgrade compared to the concept. This would be Toyota's first car to use mass produced lithium ion batteries that are being assembled in a joint venture between the automaker and Panasonic.